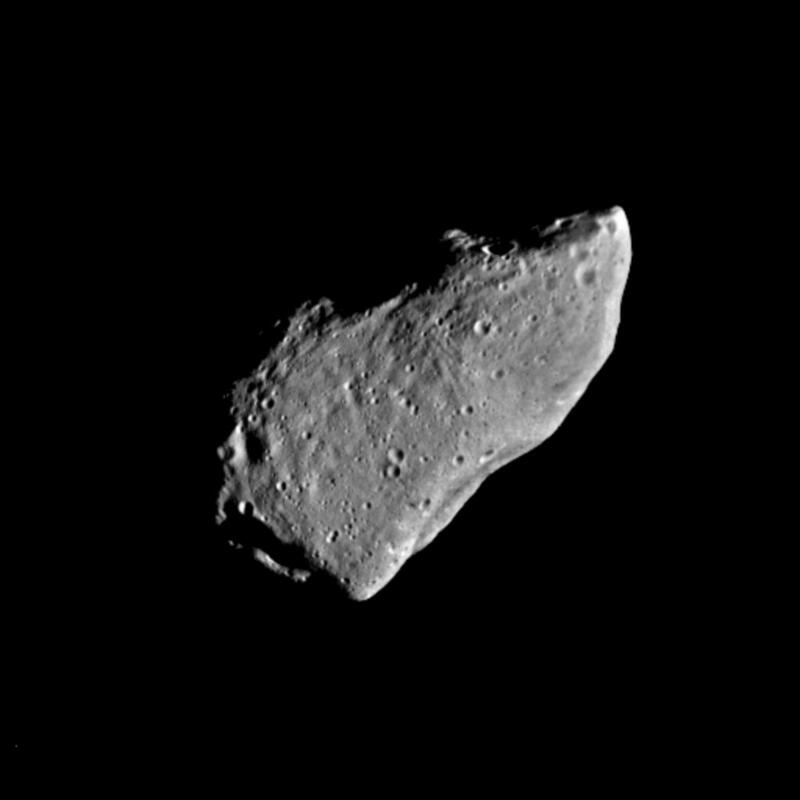 This picture of asteroid 951 Gaspra is a mosaic of two images taken by the Galileo spacecraft from a range of 5,300 kilometers (3,300 miles), some 10 minutes before closest approach on October 29, 1991. The Sun is shining from the right; phase angle is 50 degrees. The resolution, about 54 meters/pixel, is the highest for the Gaspra encounter and is about three times better than that in the view released in November 1991. Additional images of Gaspra remain stored on Galileo's tape recorder, awaiting playback in November. Gaspra is an irregular body with dimensions about 19 x 12 x 11 kilometers (12 x 7.5 x 7 miles). 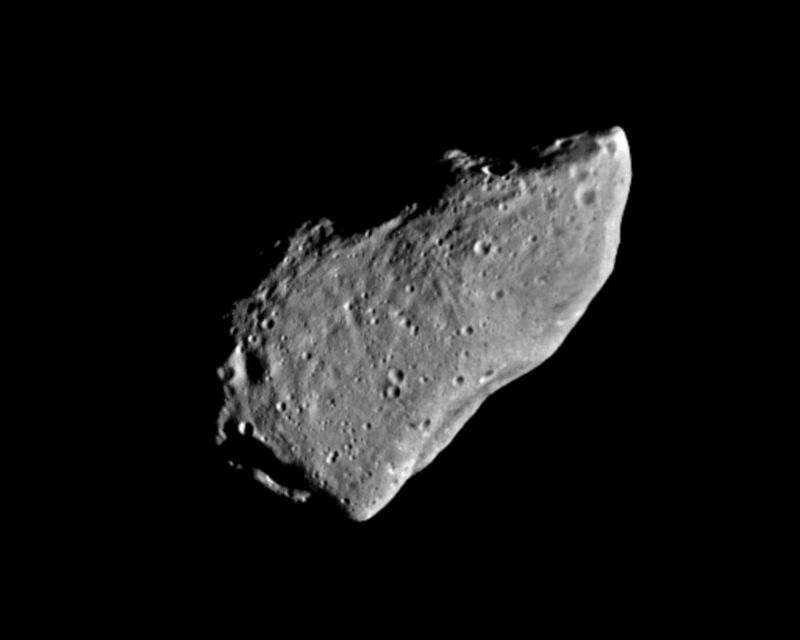 The portion illuminated in this view is about 18 kilometers (11 miles) from lower left to upper right. The north pole is located at upper left; Gaspra rotates counterclockwise every 7 hours. 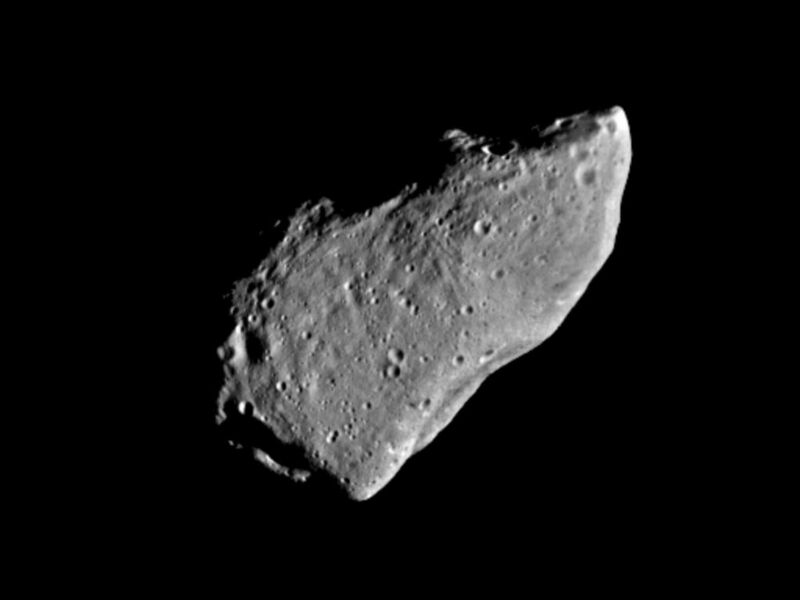 The large concavity on the lower right limb is about 6 kilometers (3.7 miles) across, the prominent crater on the terminator, center left, about 1.5 kilometers (1 mile). A striking feature of Gaspra's surface is the abundance of small craters. More than 600 craters, 100-500 meters (330-1650 feet) in diameter are visible here. The number of such small craters compared to larger ones is much greater for Gaspra than for previously studied bodies of comparable size such as the satellites of Mars. 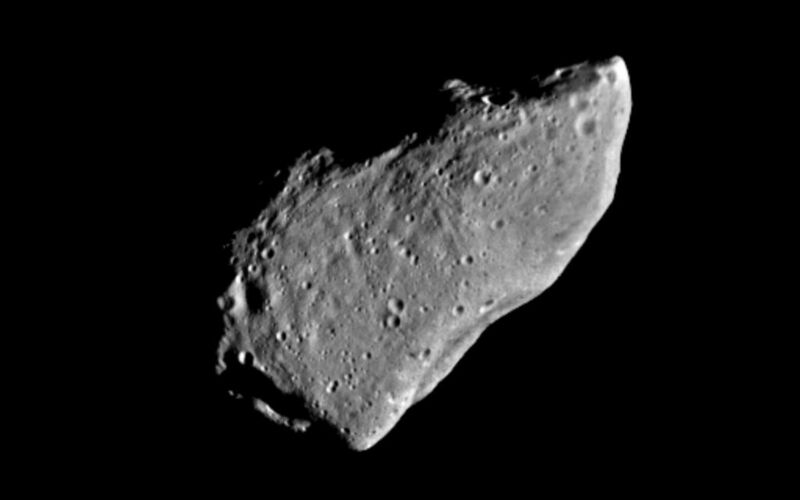 Gaspra's very irregular shape suggests that the asteroid was derived from a larger body by nearly catastrophic collisions. Consistent with such a history is the prominence of groove-like linear features, believed to be related to fractures. These linear depressions, 100-300 meters wide and tens of meters deep, are in two crossing groups with slightly different morphology, one group wider and more pitted than the other. Grooves had previously been seen only on Mars's moon Phobos, but were predicted for asteroids as well. Gaspra also shows a variety of enigmatic curved depressions and ridges in the terminator region at left. The Galileo project, whose primary mission is the exploration of the Jupiter system in 1995-97, is managed for NASA's Office of Space Science and Applications by the Jet Propulsion Laboratory.